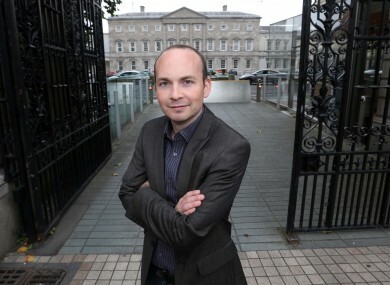 SOCIALIST TD JOE Higgins has said his Dáil colleague Paul Murphy wasn’t contacted by gardaí ahead of his arrest this morning. Murphy and two councillors from the Anti Austerity Alliance were arrested first thing this morning by officers investigating last November’s protest in Jobstown, which saw Tánaiste Joan Burton trapped in her car for three hours. Giving more details about what happened this morning, Higgins said Murphy was arrested by six gardaí who arrived at his home in two cars at 7am. Murphy’s partner had earlier told Newstalk that the politician was still in his pyjamas when the officers called. At a press conference arranged by the Anti Austerity Alliance at Dublin’s Buswell’s Hotel, Higgins said he had been out to visit Murphy at the garda station in Terenure this morning. He said he had spoken to the Dublin South West TD, that he was well and that he had spoken to a solicitor and a doctor “which is routine”. “He was about to have an interview at the stage at which I left the garda station,” Higgins said. You would imagine he was a big fellow, that he would resist arrest or something. Higgins condemned the arrests as completely over the top and “outrageous”. He said that as far as he could remember, this was the only time there’d been a “so-called criminal investigation” into a demonstration staged in the presence of a Government ministers. I think it’s over the top, I think it’s political policing, I think it’s designed to damage the movement, but it won’t succeed. Higgins confirmed that the other two men arrested were AAA councillors Kieran Mahon and Mick Murphy. Both men are still being held for questioning this afternoon. The first of the arrests was made at 6.15am this morning, Higgins said. The fourth man arrested was Éirigí activist Scott Masterson, it emerged this afternoon. Councillor Brian Leech, introduced by TD Ruth Coppinger as the party’s only South Dublin Council member “actually at large at the moment” said he had been at the protest last November. He said that those taking part in the protest were “not dissidents… we’re not trying to overthrow the State”. The Tánaiste had been sitting in her car with a mobile phone reading the paper while the “peaceful demonstration” went on around her. Coppinger described this morning’s developments as a desperate attempt to target the anti-water charges movement. She said the way the arrests had been staged had been heavy-handed, and said that during recent investigations into financial institutions, gardaí had made appointments for people to present themselves at garda stations. Wrapping up the press event, Higgins said they would call another press conference at short notice once Murphy was released. He can be questioned for up to 24 hours. Email “ "You would imagine he was a big fellow, that he would resist arrest or something" ”. Feedback on “ "You would imagine he was a big fellow, that he would resist arrest or something" ”.